We have signal. 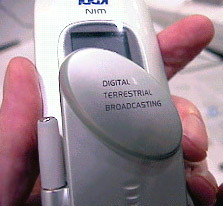 Mobile digital terrestrial TV broadcasting hits the wireless airwaves in Japan April 1st, 2006. Japanese telecom carriers and commercial broadcasters will be ready to start simulcasts of hybrid terrestrial digital programming and data feeds to cellular phones in just a few months. “Our handsets will be ready to comply with that date and we are targeting March/April 2006 release of mobile digital terrestrial TV phones,” NTT DoCoMo spokesperson Tomoko Tsuda told WWJ. No April Fools prank, the start up date was announced by Japan’s Ministry of Internal Affairs and Communications. Vodafone also confirmed to WWJ they should make the April deadline. “We are gearing up production to have handsets ready in time for the start of this new digital TV service,” says Vodafone spokesperson Matthew Nicholson. Details on when other broadcasters will start mobile programming and what contents they plan to spin to mobile should be available soon. NHK will reportedly be ready to broadcast their network programming to mobile phones in a number of prefectures in compliance with the Ministry?fs start-up date. NHK, Japan Broadcasting Corporation, is the quasi-governmental TV station here and one of the leading backers of the mobile terrestrial digital TV initiative. “April is definitely our target date,” said Hideki Kokubun, Senior Researcher at the NHK Advanced Service Planning Department. “We plan to launch 24 hour mobile simulcasts of our regular programming in a number of prefectures.” The company says it sees no problems at this time with licensing or copyright fees from re-broadcasting to the small screen, at least for NHK, and should kick off the service in around 29 prefectures. Leading cell phone carrier DoCoMo announced its first terrestrial TV enabled Foma handset September 27th, joining Vodafone and KDDI who have had working prototypes for some time. Smooth reception however is by no means guaranteed. Installation of base stations and antennas will have to be expanded to cover high rises, basement and underground shopping arcades. Questions remain over who will absorb costs for hardware installation. Broadcasters and content providers like Index Corp. are anxious to explore the revenue possibilities mobile digital TV provides. Both TV stations and advertisers can use live feeds and hot links right on the cell-phone screen to drive program interest, audience participation and, of course, impulse buying. Screens on all the prototype phones have been split with the upper portion for viewing and the lower for links and data feeds.